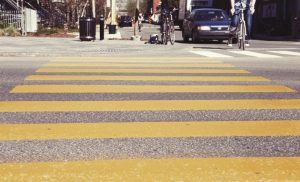 The iWalk Toolkit consists of the iWalk Guide, iWalk Videos, and the iWalkAssess app. 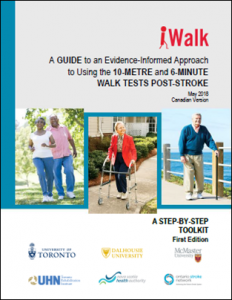 To download the iWalk Guide, click here. Online resources referred to in the iWalk Guide are provided below. Click the App Store logo to download the iOS version and click the Google Play logo to download the Android version. 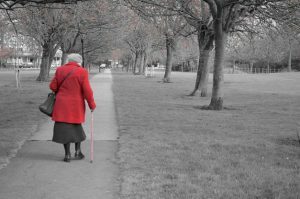 Webinar: Knowledge to action: How the iWalk Toolkit can improve walking assessment post-stroke. Presenter: Nancy Salbach. Salbach NM, Solomon P, O’Brien KK, Worthington C, Baxter L, Blanchard G, Casey A, Chegwidden W, Dolan L, Eby S, Gervais N. Design features of a guideline implementation tool designed to increase awareness of a clinical practice guide to HIV rehabilitation: A qualitative process evaluation. Journal of Evaluation in Clinical Practice. DOI: https://doi.org/10.1111/jep.13070. Salbach NM, Wood-Dauphinee S, Desrosiers J, Eng JJ, Graham ID, Jaglal SB, Korner-Bitensky N, MacKay-Lyons M, Mayo NE, Richards CL, Teasell RW, Zwarenstein M, Bayley MT. 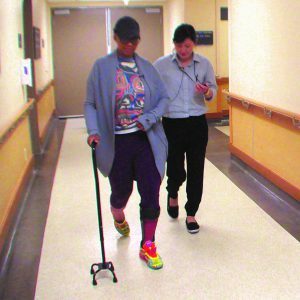 Facilitated interprofessional implementation of a physical rehabilitation guideline for stroke in inpatient settings: process evaluation of a cluster randomized trial. Implementation Science 12:100, 2017. DOI 10.1186/s13012-017-0631-7. Munce S, Graham ID, Salbach NM, Jaglal SB, Richards CL, Eng JJ, Desrosiers J, MacKay-Lyons M, Wood-Dauphinee S, Korner-Bitensky N, Mayo NE, Teasell RW, Zwarenstein M, Mokry J, Black S, Bayley MT. 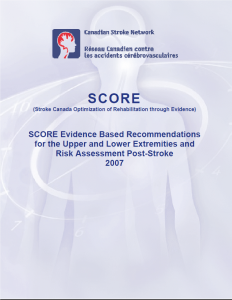 Perspectives of health care professionals on the facilitators and barriers to the implementation of a stroke rehabilitation guidelines cluster randomized controlled trial. BMC Health Services Research. 2017. Doi: 10.1186/s12913-017-2389-7. You may freely download the Word version of the EPIC Scale. Please acknowledge the scale developers by citing the articles listed as appropriate.